We were destined not to have a good night sleep the other night. There is the usual noise of the dogs shaking at times and our cat sleeping by my head. She has an incredible talent for purring. Loudly. But you get used to the normal noises. We weren’t getting the normal noises this night. In the fog of my brain I heard what I thought was one of the dog peeing by the side of the bed. Which didn’t make any sense at all. So I dismissed it but then I realised Guinness was sniffing around the window by my side of the bed pretty intently. At the same moment I remembered the craft bag with the jumper I’m knitting for my husband so I leapt out of bed (not a good idea for my back) and felt round and found everything dry. So what was the sound? The window is about 6 feet by 4 feet and has the winter plastic still on it because the window is a bit drafty. Guinness kept alerting and sniffing at the window. I hear what sounded like wings at first. I was thinking a bird but there isn’t anyway for a bird to get in. Then it sounded like a bug buzzing. Then I heard the wings again. So something got in. A tiny bat. Though big enough I still can’t figure out how it squeezed through. Then we were stuck with how to get it out without killing it or it getting into the room past the plastic. The end result was my husband going out through the guest room window and along the porch roof to our room to remove the screen. I sliced the plastic to unlock the window. At this point the bat was up at the top of the window and still as could be. I honestly thought it might have died. Of course I was keeping my fingers crossed that his little friends wouldn’t join him and we’d wake up to a crowd of bats. Luckily he eventually left. We were so exhausted! So I needed a quick meal because I just didn’t have the energy to do anything complicated. I had some ground lamb and I was in the mood for some Greek flavours. A burger and a salad would do the trick. I’m so proud of myself. Well I should say ourselves. We grew herbs in pots. Inside. And they lived. My skill set for gardening definitely lends to the outside bit of gardening. One of the herbs we grew is oregano. In a bowl chop a few cloves of garlic and add a teaspoon of fresh oregano. 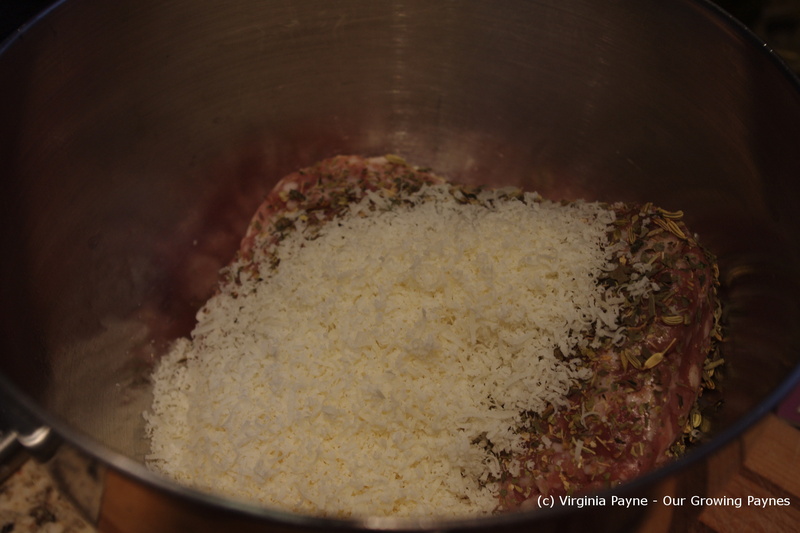 Then add a couple of teaspoons of red wine vinegar and olive oil, a tablespoon or so of panko bread crumbs, and half a cup of feta cheese. 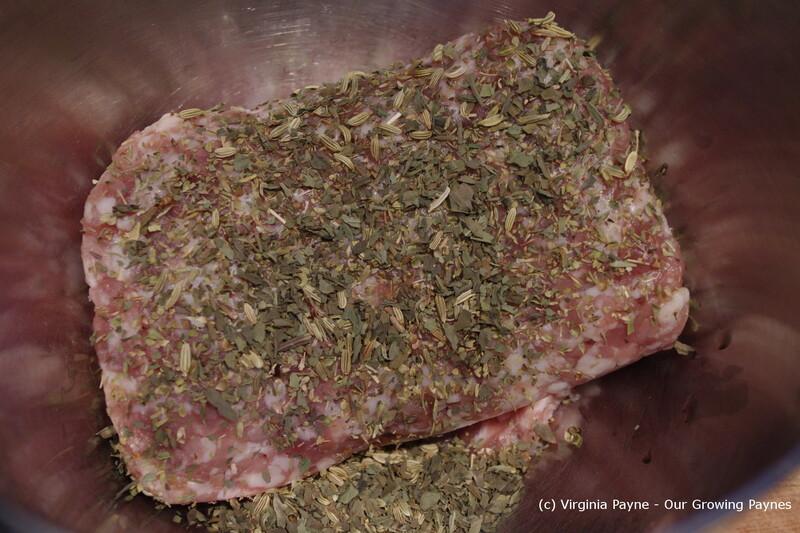 Season with salt and pepper then mix well without overworking the meat. Form into patties. While the grill is heating up mix up the tzatziki sauce and greek dressing. Grill the burgers until they are done making sure you get a nice sear on them. Throw together a quick salad and serve with the dressing and sauce. This was really good with a cabernet. And gratefully last night was uneventful. No more uninvited guests! 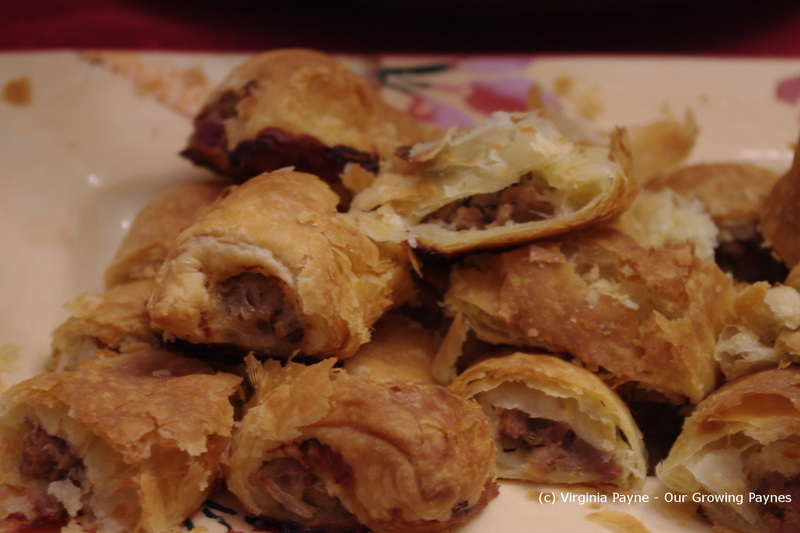 We had friends over a few nights ago and I made sausage rolls as finger food. I don’t make it often because there are only so many Zumba classes I can take! But these are super easy to make and very yummy. 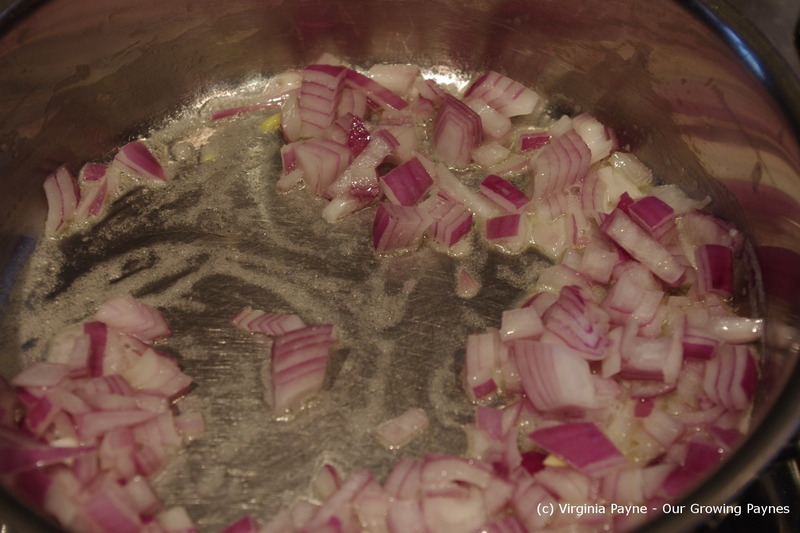 To start with chop half an onion and saute in melted butter. Once the onions are soft let them cool a bit. 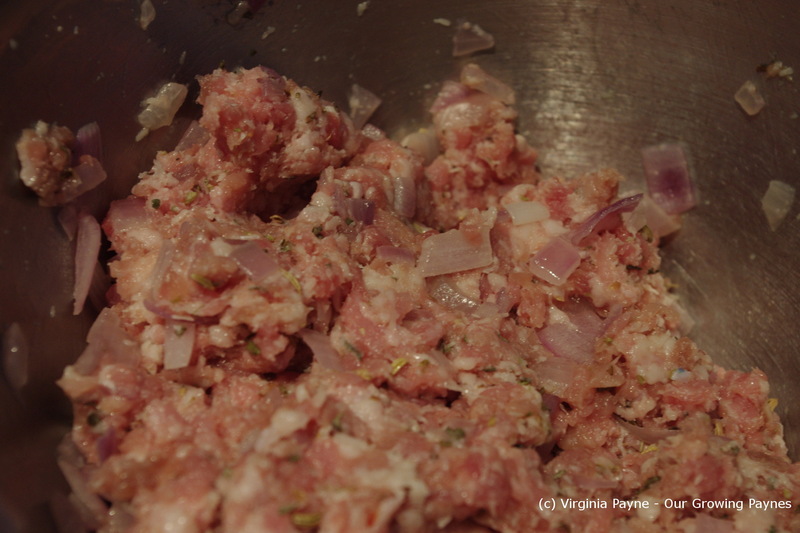 In a mixing bowl add about a pound of ground pork, some fennel seeds, salt and pepper, oregano and basil. Freshly grate parmesan cheese. About 3/4 cup will do and add to the bowl. Roll out some puff pastry. One of these days I’ll learn how to make it from scratch but until then store bought it is. 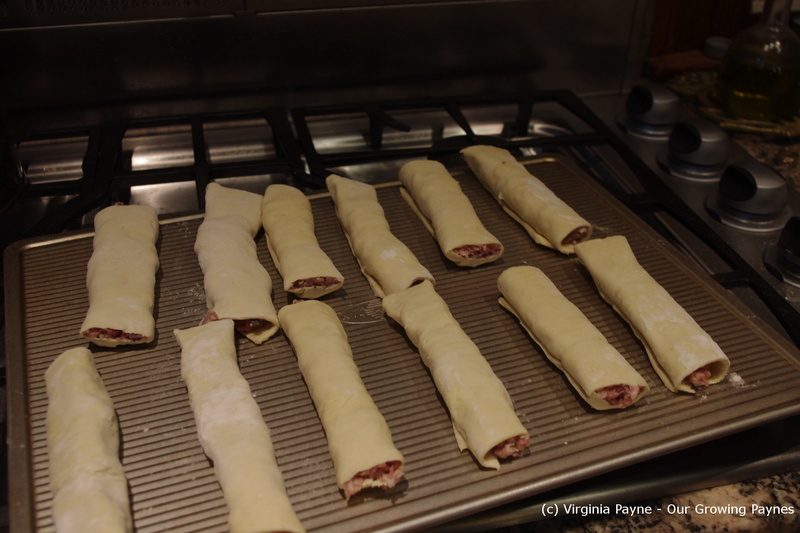 Place a line of sausage onto the pastry. 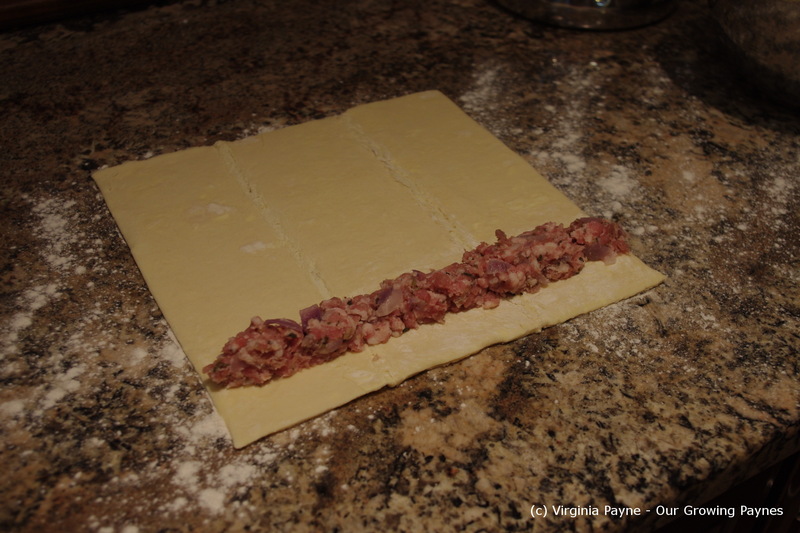 Roll it once to surround the sausage and then use a knife to cut the pastry. Cut the roll in half and place on a cookie sheet. Bake for 15-20 minutes until the pastry is golden brown and flaky and the sausage is cooked through. I’ll be on the road this week so it will be a bit before I do my next post. See you soon!